This isn't really the begining of Bergen Rocks 2010, plans and preparations have been taking place since Nov 09. 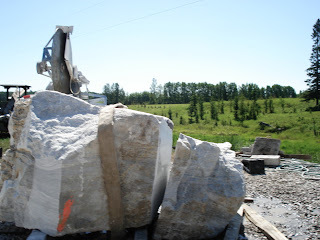 Two weeks ago we took a four day trip to Vernon BC to locate stone, these are the boulders that will be turned into fantastic works of art over the month of July. All of them are marble, Saeid is the only sculptor that will use sandstone this year. This truckload of stone arrived on June 28 and at the same time that Peerapong arrived from the airport. He climbed onto the trailer before his stone was unloaded and inspected it. His comment when asked if it was a good one. "I love my stone". I'm sure it is going to be lovable to all in a month's time. This is Saeid's sandstone and my girlfreind Christine. We noticed a crack in the stone that wasn't evident when we loaded and brought it here. 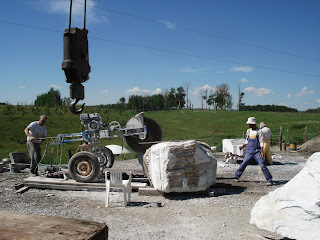 So, we cleaved it with wedges and blocked the larger top piece up for the crane to take off when the marble arrived. Peerapong was a participant in Bergen Rocks 2008 where he created "Movement in Space" from sand stone. Everyone that visits the Bergen Sculpture Park enjoys this sculpture`. 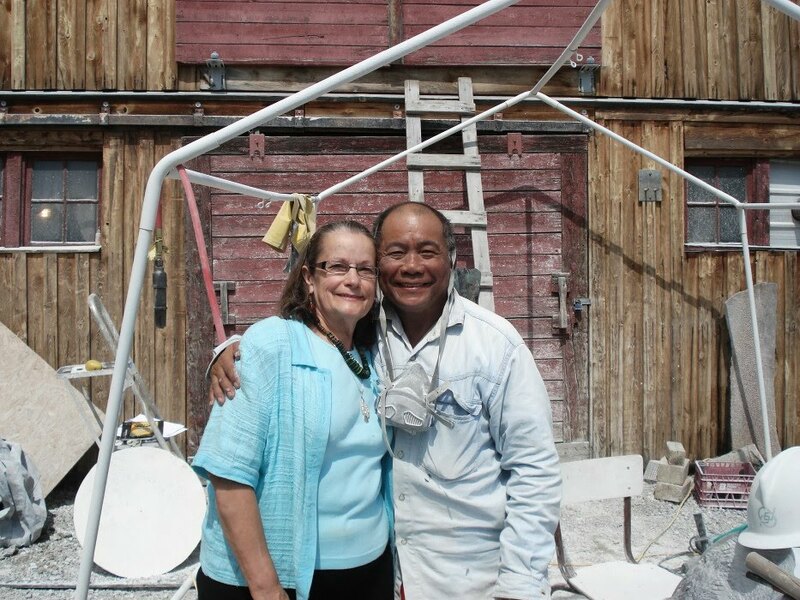 This year he is working in marble, his sculpture will be titled "Rising Sun". Saeid has lived in Ukraine for 17 years but is still an Iranian citizen. He is exploring stress and tension for his Doctoral thesis. The sculpture he creates here will be a part of that study and titled "Repression"
Tony is the first Canadian to participate, he's from Quebec. I spent a month in Russia with Tony and his wife Ermenia in 2008, they have new grandchildren and Ermenia stayed in Quebec to help their daughter out with the twins. Tony is creating a piece titled "Canuck", it will be exciting to see it finished. Bergen Rocks 2010 is symposium number 45 for Tanja. She has monumental torsos placed throughout Europe, New Zealand.....She also has one in St John Port Joli in Quebec. We are so pleased to host Tanja and assist her in realizing another sculpture that will be enjoyed by Canadians until long after the story of it's creation is lost. Mohamad is a brilliant young man, already having been credited with several important sculptures in his home country. We are glad to host him in Canada where he will create a sculpture of a goat, an animal that is important in the culture of his home country. I'm looking forward to the next month working with Mohamad, his sculpture will be beautiful and help to share his culture with us for a long-long time to come. The short video above shows how Carlos was treated, by our consulate in Cuba (his stone behind the tractor) as a professional artist who would come to Canada and create an art work that would be enjoyed by our society for centuries into the future. 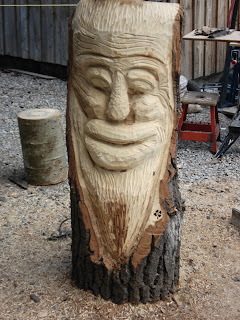 He has sculpted in Quebec and at Bergen Rocks 09 demonstrating that he is willing to come to Canada and share his artistic talents with the public and other artists. 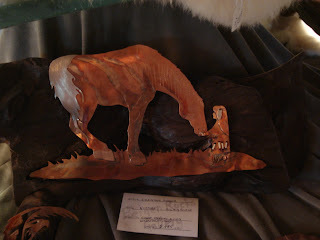 This year he was refused a visa dispite letters of support from Sculptors Association of Alberta, Stone Sculptor's Guild of North America, Prairies 2 Peaks Tourism and MP Blake Richards. In other countries visiting artists are treated with the same regard as atheletes regarding permission to visit. Can you imagine the outcry if a member of a hockey team from another country was denied the opportunity to visit and contribute his/her talents to us (and for the duration of a competition) Saeid was also refused and Mohamad but appeals with the letters of support we were able to get that decision reversed for them. Saeid's visa was issued on July 12, halfway through the symposium and Mohamad on July 5...but at least they got here. 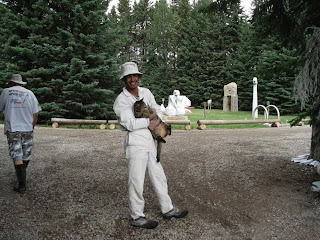 Last year Gerard Oroo Montondi (gold medalist in the 2008 Beijing Sculpture Olympics) was also refused as was Chander Parkash, also an internationaly recognized artist. Big Thanks to Blake Richards and his staff for their efforts assisting us to get these artists here, without that I am pretty sure that Mohamad and Saeid would have been staying home too. This is me, Morton. I have a blast doing this kind of thing. Tanja's stone is the largest (about 12,000lb) It still amazes me that in a months time these stones will be incredible works of art. We started on Tony's stone by making a cut on the bottom and one side but the second cut didn't cleave the stone right through because it wasn't very thick. Tony is drilling the ledge and will cleave it off with wedges. We couldn't do it without volunteers, Brad Callihoo from Edmonton came down several times. He cooked meals, cleaned up the site, ran to town for things, assisted the sculptors, pretty well anything we needed to have done.....and he only has one leg. If it wasn't for the volunteers that come from all over Western Canada to help make the event a big successwe wouldn't be able to keep it open to the public. Volunteers came from as far away as Kelowna this year. 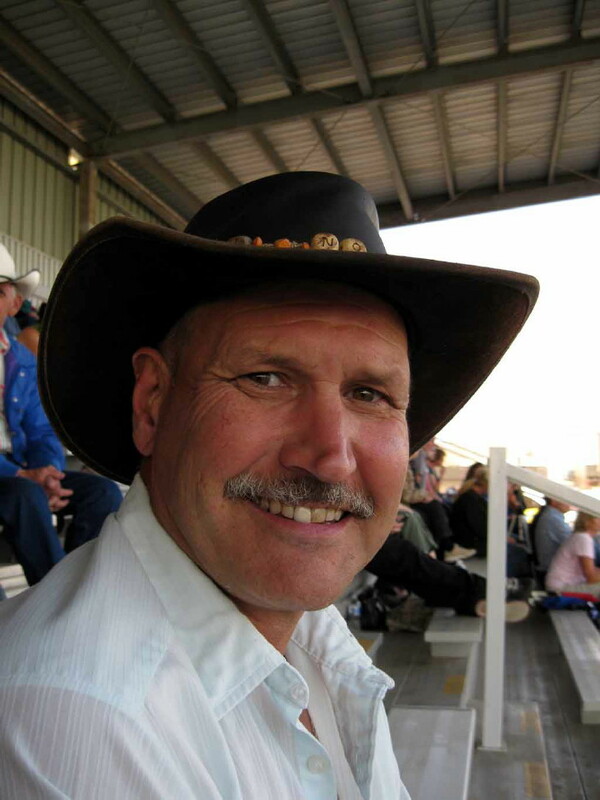 Mark Stuthiet from Red Deer was here every weekend. He has three really good attributes for being a great guy to have at the symposium: he's got super technical skills and helps keep everything running, strong like a bull and he plays guitar....we can use his skills from sun up until late into the night. Two of my sisters and brother inlaw came over one evening and did a sing song around the campfire, real western Canadian fun. The participants loved it. Greg McMartin from Bowden and his two kids spent almost the whole month here. Greg set up in the sculpting area and did several pieces from wood. It is really nice to have locals getting involved. Mohamad told me he had met Saeid several years ago and admired him then, now he was really happy to have a chance to work with him as a peer. They had a great time together. Peerapong started on his stone by drilling holes and wedging off the exterior until he gets down to the rough form he wants, then he will use a grinder with diamond wheel and hammer and chisel before moving to tools that will smooth and polish. To be able to cut on the top of Tanja's stone we had to put the old saw up on a trailer with planks under the wheels so that when the blade is down in the stone we can roll it back and make a cut the full length of her stone. This is the cut we made, but as with Tony's stone the piece to come off was quite thin and we had to cleave twice to get it all off. You can see the wedges in the cut. Peerapong is making headway, working all around his stone. You can see that this really is hard work, but very rewarding. It is a good feeling to make an artwork that you know will be around for much more than a thousand years. I think that helps to keep us going. 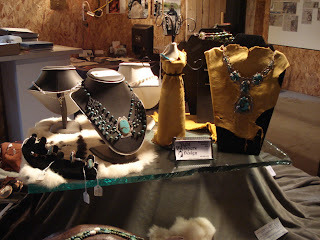 Christine did an awesome job of hanging the show in the gallery, it was beautiful. I think everyone that came out to the symposium checked out the gallery, work by local artists and the international participants was exhibited. The quilts by the Bergen Ladies Aide were displayed above these show cases on their frames, it was a really neat exhibit and a lot of people commented on it. It is nice to showcase some of the fantastic skills of our local artisans. I hope that exhibiting non- traditional mediums like quilting will help us all to realize that there are talented people everywhere (even at home) and we should celebrate their skills and their art. These masks by Danny Joe Jones from Bearberry were a great inclusion in the gallery. Tony is cutting on the top of his block now, it will eventually be the front or back. Where he is cutting will be at the base so this saves a lot of back breaking work after it is stood up. Peerapong has taken tousands of chips off his stone, now the form is begining to take shape. Tony has the silouette of his sculpture completed and we stood it up. 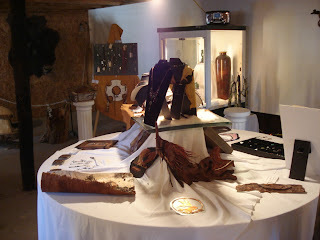 If it is possible it is nice to see your piece in the orientation that it will be placed in. Now he can begin shaping the front and back surfaces as well as working the hole from both sides. Tanja's block has a lot of stone removed, she is moving quickly. Today she recieved email about a family emergency, she will return to Germany in two days. I hope that we will be able to have her return later or in the future to complete this torso. "Canuck" is laying down again now and Tony is working on the top surface. Will Truchon, an Alberta sculptor, made it down a few times over the event. The day after the closing he did a piece that will go into the sculpture park along with the others. Great to have people drop in and lend a hand, without them the event just wouldn't be possible. 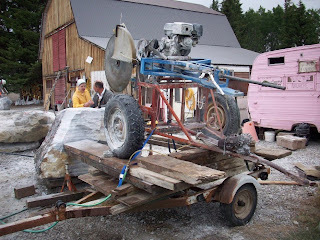 Steve Turner a sculptor I met in Viet Nam spent the month helping out, he assisted with running the big saws, chiseling, moving stones....what ever needed doing. Steve also does metal work, some of his folded copper forms are incredible. Mohamad began work today, at first we thought his stone was going to challenge us but after some contemplation we realized we were just looking at it from the wrong angel. His stone will actually accomodate a sculpture a little larger than what he had planned. First thing was to make a cut on the end of his stone. 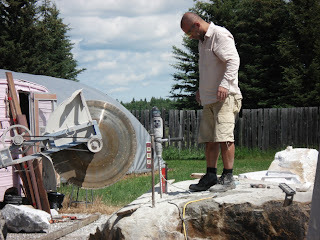 He really liked the old saw, it is a work horse, I couldn't guess how many tons of stone this saw has cut over it's life. 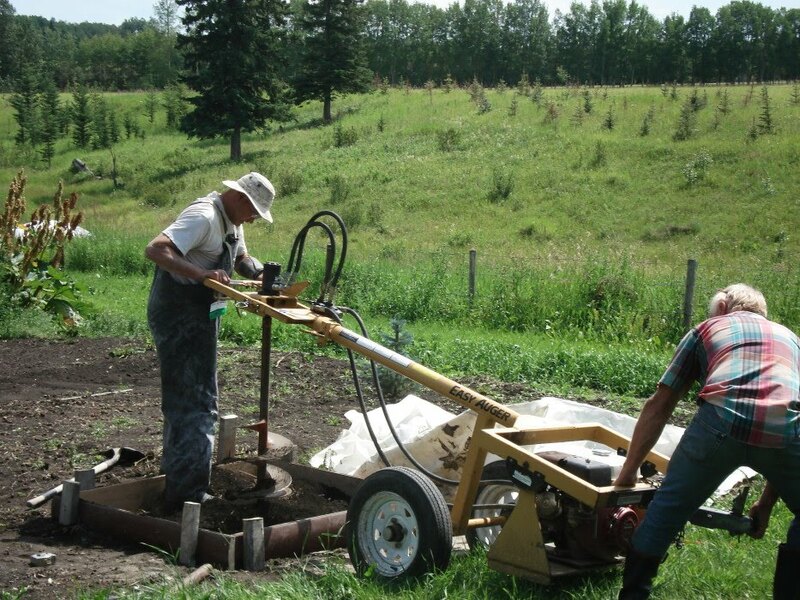 I got it in BC, it used to be a prospectors saw used for mining jade. This is the result of Mohamad's first cut, another big piece to come off the other end will be next. The outside of "Rising Sun" is really taking form and Peerapong has made some headway on the negative space from the top too. Rainy today but the temperature is OK. Last year and the first we had some cold days dispite the time of year, I hope it stays nice for us this year. Although we can turn the stones with our on-site crane it is sometimes easier to just climb up on the material. Tony is getting the basic form onto both sides of his piece, when he has that completed he will start to create surfaces, some with texture, some polished. Brad, volunteer from Edmonton, brought salmon, steaks and all the fixins for a delicious BBQ on Saturday. Melody and Steve from Okotoks helped out and we had a meal fit for a king. A campfire after it started getting dark finished off the evening. Well, actually.....we sang some songs, lit sparklers and had fun with glow sticks. This video shows the old saw in action, it is really a time saver to be able to take off pieces that wiegh several hundred pounds with each cut. Mountain View County generously granted $4000 to help host this years event, that demonstrates thier support for the arts. Reeve Al Kenemere spoke to the crowd at the opening ceremony. During breaks we visit, share artistic inspirations and techniques. Now with his stone standing up Peerapong starts to work on the back side. Volunteer Christopher White eyes up a cut to be made. Sept 12, Saeid arrived today, this is the stone he will use. We have had good luck with material in the past but when Saeid's stone got to the site and we cleaned it up there was a big crack in it we didn't see. The stone is thinner than what he had designed his sculpture for so he had to come up with a new design. A bit of a rush too as his visa was issued so late. The new maquettte is made from clay, he can reshape the model until he likes the form and still be sure it will fit into the stone. 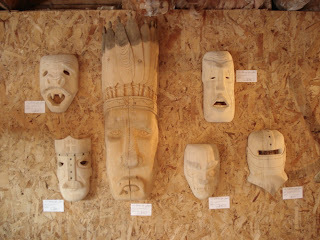 If you use wood and cut too far you have to start again so clay is often the first step in developing a form. To begin Saeid had to take a long strip off the top of his block, we decided the best way to do that wpuld be to drill and cleave it. So he begins drilling holes 18" deep and about 4" apart along the line he wants to cleave the stone on. To get the best result all the holes should be alined vertically too. You can see the steel rod in the first he drilled, there is a level on the left side of it. By leaving that rod there it is easier to keep the rest of the holes gong in the same direction. After the holes are drilled chisels are placed in each hole and then they are tightened progressively until the stone cleaves. You can see the crack working it's way down the stone in the forground. About Sept 10 we placed a pad to move Pauls cross from last year, "The Elder". The location is beautiful for that piece, with nothing but open fields and sky behind it will look great here. 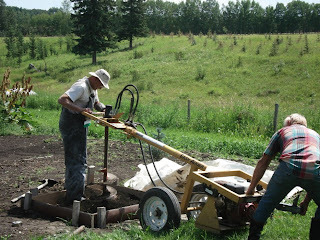 Here we are drilling a hole for a column of cement that will keep the pad from tilting. A careful check is wise before you begin making a cut as the material can't be put back once it is gone. On Tuesday we went to the Calgary stampede. It rained all day but luckily the temperature wasn't too cold. As you can see the infield was a mess, bronc riding, barrell racing, bulldogging etc were all new, lots of pictures and videos were taken. We toughed it out. As always the stampede was wonderful entertainment and we toughed it out throught rain wearing garbage bags to stay dry. Tony has "Canuck" standing up now, he will begin polishing soon. Peerapong has almost gotten through his stone, there is still a lot of work to do before he will start finishing the surfaces. Steves parents stopped out for a couple of days. Peerapong was feeling a little chilly but as you can see the weather was mild for us. We'd have a hard time adjusting to the temperature in Thailand too, just the other end of the scale to deal with. 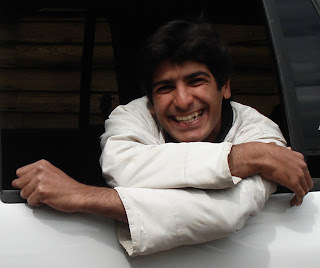 Mohamad played with the cats and drove the tractor for a 1/2 hour or so every day. Mohamads goat will have a hole about in the centre of it's body. We are discussing the angle and location. I make several plunge cuts witht the chain saw. This is an incredible tool for this kind of job, it would take a whole lot longer to do this with a drill and grinders as we would normally do. Big thanks go out to River City Developments from Red Deer for providing the chain saw. It was a big help for Peerapong too. This is the result, after athe frets are reemoved by wedging with chisels the hole will be a long way toward being finished. We don't always work, most evenings we spend some time talking about work, the countries around the world that everyone comes from or just walking around the acreage looking at the artworks and mixture of stuff I have that a lot of people would call junk. Peerapong was glad to see Shirley, he met her here in 2008. That year she was here the whole month, she cooked and looked after the art gallery. Shirley is also the founder of the Atti2ude Club which she never have thought would grow into such an organization. There are members in more than 12 countries now and we are doing arts events around the world, of course Peerapong is a member. It's great to have a chance to renew friendships with people you thought you may never see again. Saeid gives the thumbs up for another cut, the saw closer to the camera is actually just sitting there but it looked like a great photo. This is the view that visitors get of the site, you can see the barrier rope just in front of the camera. 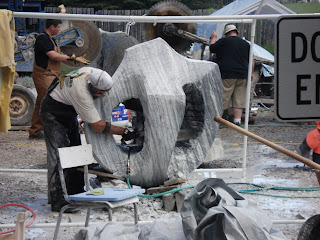 Greg McMartin from Bowden is working on the wood piece in front, then Peerapong, then Steve chiseling on Saeid's stone, then Tanja's stone with the tent over it. Mohamad and Tony are on the right. People can also walk down the right hand side of the site and see these artists working from the front. Here's another piece that Greg completed since the first of the month. It's great to have some local artists getting involved. Later in the month the Stone Sculptor's Guild of North America will be doing an exhibition and demonstration for a weekend, the quilts by the Bergen Ladies Aide is getting lots of comments, Danny Joe Jones and Sally Banks have some pieces in the gallery and some others too. Ha, ha. Saeid was telling me he had never seen so many workers just coming to help, he can hardly cut fast enough to keep them working. With 12 days knocked off his time here by our consulate he could not complete this work by himself, Steve, Daorian, Brad, Pieter and Christopher are all helping him to complete his work before he leaves. To cut on the top of Saeid's stone the saw had to be raised and blocked up. Christopher and Pieter have been heading up that work, I have been pretty busy with the chain saw for the last few days. I have always known what Mohamad planned to make, a lot of people don't see the goat even if you tell them but from this angle I think you can see it pretty easily now. Tony is working quickly, as he has to leave on the 28th his last day for working will be Sunday the 25th. They are going to Banff on Aug 27, the 26 will be the day we install "Canuck"
The little saw (30" dia.) cutting in on an angle will save Saeid a lot of work with a grinder, hammer and chisel. His basic form is begining to take shape, with large pieces removed he can begin to work closer to the final surface with hand tools. Tuesday River City Developments from Red Deer sponsored a trip to Drumheller with a tour guide for the guys (Tanja is back in Germany). Rod was great and will be the guide for next weeks trip to Banff too. 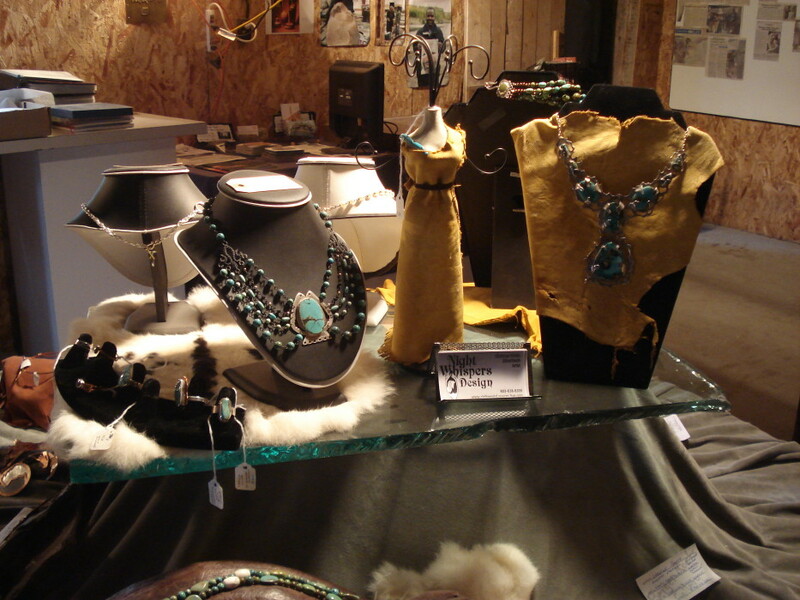 River City has become a great supporter of Bergen Rocks and other artistic endeavors too. 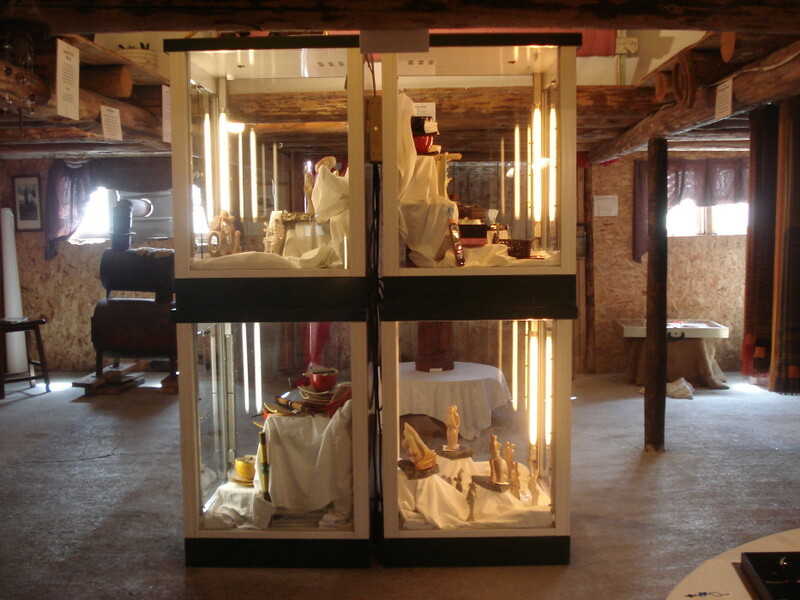 In Dec. 2010 they sponsored and hosted an ice and snow carving festival including dance performances, live music etc. called "Elements in Ice", a group I belong to organized it. The event was held on the site of their downtown development "Elements at Rivers Edge". Big thanks go out to Ken and his people at River City for their support of the arts, we look forward to future projects working with them. Rod took them out to a buffalo ranch where they rode out on a wagon behind a tractor to feed the buffalo. This was really enjoyed, buffalo are unique to North America and their image is familiar to people around the world. Then they went to the Last Chance Saloon for a buffalo burger, The little town of Rosedale and this hotel are at the end of a very short road (5km or so) and there are 13 bridges to cross to get there. It is in an old mining town, at the time it was worthwhile to build all those bridges to get the coal out. The mine is closed now but 1000's of tourists drive out there each summer just to cross all those bridges. The next day it was right back at the work, Steve and Dorian are assisiting Saeid, I am cutting with the chainsaw on Peerapongs piece. It was too tight to get in there easily so I had to use one arm through one hole and the other from the hole in the back. 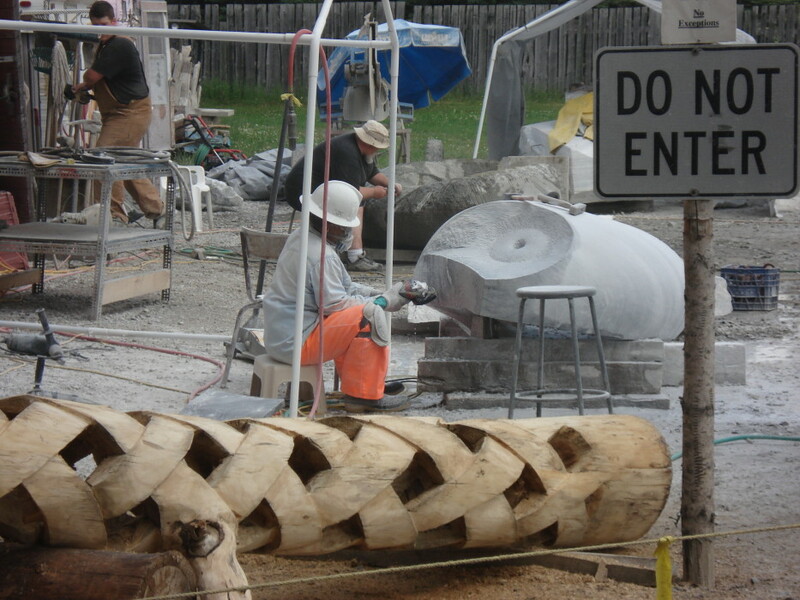 You can see the tip of the chainsaw at the bottom on the right of the sculpture. Even though the work is hard and there is a lot of it we still have fun throughout the day, Saeid and I joke about something as Dorian chisels on "Repression". Pieter and Saeid discuss the next cut. This volunteer just showed up one day and asked if we could use his help. He ended up coming over for most of the day for the better part of 2 weeks and seemed to love it dispite the hard work. this is the kind of enthusiasm that makes Bergen Rocks possible, without the volunteers that help out so much in so many ways we just couldn't do it. If we could hold this in a town I'm sure there would be more helping hands in many ways, meals, at the work site, day trips etc. I think that if we keep it going some municipality or institution will see that this is a great way to hold an interesting event, attract tourists, beautify their community and create a legacy that will endure for 1000's of years into the future. We make parallel cuts on the stone and then knock the pieces off with a chisel, these are called fret cuts. As we get closer and closer to the final surface that we want the cuts are made smaller and closer together. You can see the crosshatch cuts that Peerapong is making now, this will create a smoother surface than the larger fret cuts. The next step will likely be with grinding wheels and then moving to polishing pads impregnated with diamonds. 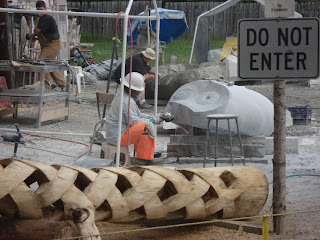 To make the cuts on top of "Repression" we had to raise the saw and block it up on timbers, we just have to wiegh the options of laying the stone down or moving the saw. Seemed simpler to move the saw this time. Tony is putting finishing touches on now. Here he is creating texture on some of the surfaces by carefully chiseling. You can see that he has left a border of smooth stone at the edge. If he were to chisel too close to the edge it is almost certain that chips would break off, definition is also improved by leaving that smooth edge beside the roughened area.